When you buy a pack of liquid yeast, there are two things you should be aware of. One is how many cells are in the pack. For yeasts by WYeast and White Labs, that number is typically about 100 billion cells. For other manufacturers like Omega Yeast Labs, that number is roughly 150 billion. The second thing you should be aware of is the packaging date. The packaging date is important, because conventional knowledge tells us that yeast viability decreases by about 20%-25% a month. So, to calculate proper pitching rates or yeast-starter size, the date is needed to get an approximation of how much viable yeast is available. Earlier this year, Brulosopher, of BRÜLOSOPHY, posted a short article on his yeast-harvesting method. Basically, the idea is to make a starter larger than you need and end up with roughly 80-100 billion cells in excess so that you can build a new starter from the yeast in the future. This method is cleaner and less time consuming than previous methods, which include washing the yeast from a previous batch and re-using that. I started harvesting yeast using Brulosopher’s method a couple month ago, not for every batch but absolutely for those that use yeast I plan on using again, like Scottish Ale Yeast from WYeast or The Yeast Bay’s Vermont Ale Yeast. The problem is that yeast is only viable for so long, which is why the packaging date mentioned earlier is important. Now, everything pertaining to yeast cell counts is a gamble. 100 Billion cells is almost never actually 100 Billion cells, but can fit within a range. So, moving forward, we need to operate under the assumption that these numbers are general answers, and not specific case instances. We are also going to assume storage at refrigerator temperatures in liquid cultures. Why Can’t I Store Yeast Forever? Yeast is a living organism, and so it can’t just sit forever. As yeast sits, it slowly begins to consume its glucose reserves, weakening its internal structure and eventually resulting in the yeast’s cell walls rupturing, killing the yeast. This rupture is actually what is responsible for autolysis, a factor of off-flavors in beer. So, if you can’t store yeast forever, how long can you store it? To elaborate, there is a non-linear 20% decrease in viability per month. That means that if you begin with 100 billion cells, then after a month you would have 80 billion cells. After two months, you would have 64 billion cells. So the 20% decrease is not from the initial cell count, but from the cell count at the beginning of the measuring period. This non-linear model is the same model that the blog Homebrew Dad uses in its yeast calculator. So, obvious flaw, this model would result in always having some semblance of live cells, which isn’t the case. Eventually, all the yeast will be dead (things are getting dark here…). However, I’m not sold on the 20% decrease in viability. This is mainly for anecdotal reasons, but that’s enough for me to start looking. What’s the Max Amount of Time I Can Store Liquid Yeast?. Before doing my own research, I turned to people who certainly have more experience than me. The first point comes from Brian of Brouwerij-Chugach in his response to /u/UberG33k of Immaculate Brewery. /u/Uberg33k asked if anyone maintained a yeast bank, a collection of yeast to be cultured and used for future batches. Here is Brian’s response. Basically, he gives some speculative timelines for storing yeast. His assumption for liquid yeast at refrigerator temperatures is one to two years (you absolutely need to use a step-starter to build it up at this point). I think this is a little optimistic, but Brian knows what he is talking about, and my doubt in the 20% numbers gives me enough of a reason to believe there is something to this. Second point comes from some emails I received from The Yeast Bay and White Labs. If you’re unfamiliar with The Yeast Bay, go ahead and check it out. There is some awesome work being done in making some less-available strains more accessible. Personally, I’ve only used Vermont Ale Yeast, supposedly cultured from the famous Conan yeast. I also plan on using either their Saison Blend or Wallonian Farmhouse Yeast in a Belgian Dark Strong/Imperial Dark Saison I’m planning. 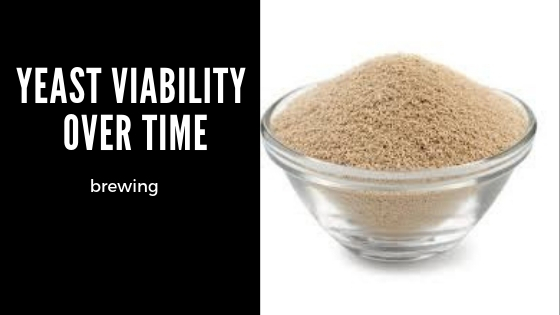 In my response, Nick (founder of The Yeast Bay) mentioned that there are a lot of factors that go into yeast viability over time, and that there isn’t a one-size-fits-all answer. Nick says to use a yeast calculator to determine viability, because these approximations are all we have. White Labs also mentioned there were too many factors to accurately determine yeast viability, however they did mention something that was in line with what Brian said from earlier, that, even under poor conditions and a long period of time, a few cells can remain viable (in theory) to culture more yeast from. A: If both are fresh, liquid yeast outperforms dry yeast until about 130˚F. Important, because this demonstrates liquid yeast’s vulnerability to temperature, which makes storage temperatures even more important. B: Old (two years) liquid yeast failed to ferment at all. So, glad we found a roof on this thing. But two years? That’s the high end of Brian’s estimate, and way beyond the 6 months that a 20% linear depreciation rate would give. So what do the actual numbers look like? Obviously, the answers above aren’t specific enough enough. They point to a longer storage period than 6 month, but not to the actual viability of yeast. But it gives me hope. Take a look at this experiment detailed on Beer Advocate. All credit to LeeryLeprechaun. LeeryLeprechaun decided to restart his tests after this and I haven’t seen any other results. However, his findings are consistent with the 20% depreciation rate, but absolutely blows WYeasts recommended storage time (max two weeks) and the “50% viable after two weeks” number out of the water. This next article is from Woodland Brew. If you’re interested in the specific details of the article, please give it a read. It is an awesome article. The 20% decrease equates to roughly a .7% decrease in viability a day. Steven, the author of Woodland Brew, tested seven different yeasts and found an average of .2% decrease in viability a day. This changes the 20% a month depreciation rate to about 6%. This is awesome information, particularly because Steven is clear that his samples are refrigerated and that is what we are interested in. Steven has also posted this on Reddit before, and honestly deserves some more credit for the post. So, here we have a much smaller depreciation rate, which is fantastic. But should calculator’s change their conditions because of it? Personally, probably not. A 20% depreciation rate means there are less cells available, and so a larger starter (or more step starters) would be recommended, which won’t hurt anything and could result in more cells overall. This could possibly lead to over-pitching, but over-pitching can be a bit difficult to achieve on a homebrew scale. The point of the findings here is that you can absolutely store yeast for longer than six months, and that 20% depreciation rate is bunk if you are storing yeast under good (not even optimal) conditions. The 20% that Jamil claims is a good rule of thumb, but I think there is sufficient evidence to claim that it isn’t a dead-on number. Maybe not even all that close. Without a microscope, there isn’t much more I can do in terms of this, but I think there is enough here to warrant more tests. I am going to continue sending emails, hopefully someone with a background in yeast and chemistry finds it interesting and would be willing to conduct the tests. If so, I’ll keep you all updated. Moral of the story? Your yeast is probably more viable than you think it is, so get that starter going! So How Do I Store Yeast for a Long Time? Make sure you are storing your yeast in cold temperatures, the ideal temperature range is about 33˚F-38˚F¹. Never let the yeast freeze, try to keep it as cold as possible. I’d aim for 34˚F. Store it with the same wort you would use for your yeast starter, low OG (1.040) and no hops. Store it in a sterile container. Store it with as little oxygen as possible. In storage, yeast can still produce Co2 for a while since most refrigerators aren’t cold enough to stop the yeast immediately (and you wouldn’t want ti to be that cold in this case). For this reason, you want to release Co2 from the container every now and then for the first day or so. Store in sterile plastic, in case the Co2 builds up. Plastic should be more resistant to the pressure. I personally use these test tubes. Always make a starter, and if you are storing longer than six months I would recommend using a step-starter. Use a yeast calculator. Even though the 20% number is more than likely not accurate, it is a popular rule of thumb and can give you a general idea of how large a starter you should be using. Plus, if you have more viable cells than the calculator thinks, than that’s a bonus. If you want to store yeast for longer than a year, or want to have a larger bank, you should look into storing yeast on a slant and freezing it. Hope this was helpful for all of you, it definitely was for me!